Remember how we were (or I should still say "are") renovating our laundry room? I promise that it will be a pretty good reveal in the next few weeks... we are WAYYY behind schedule for several reasons, one being our vacation, the other being that our cupboard took several weeks to get here and then once we opened it up to assemble it we discovered that it was broken into multiple pieces. So we had to continue the waiting game until just recently. But besides our cabinetry we are pretty close to finished! The first thing I have learned is that painters tape is your best friend for this job! 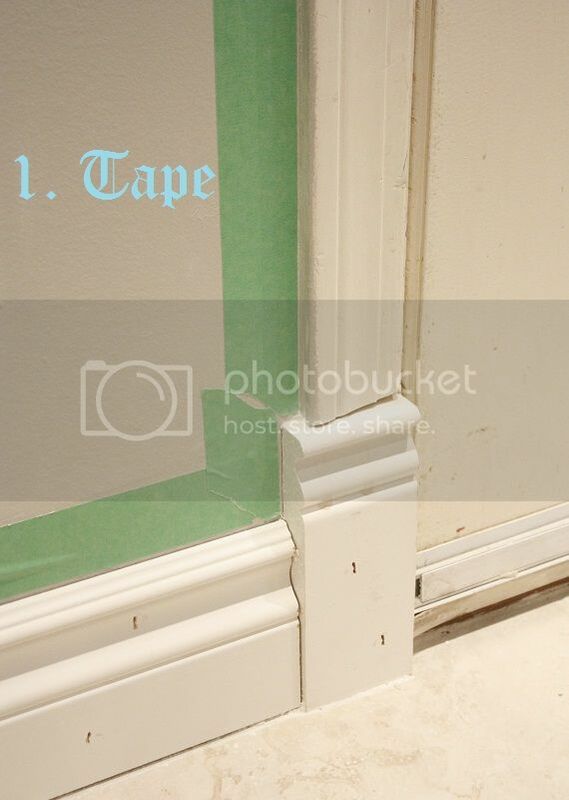 Not only because it keeps the caulking straight and tidy, but because if you weren't aware silicone is a big fan of right angles. When you just drag your finger through it over time you see it start to pill and wear away, and using tape to make a clean line will prevent that! 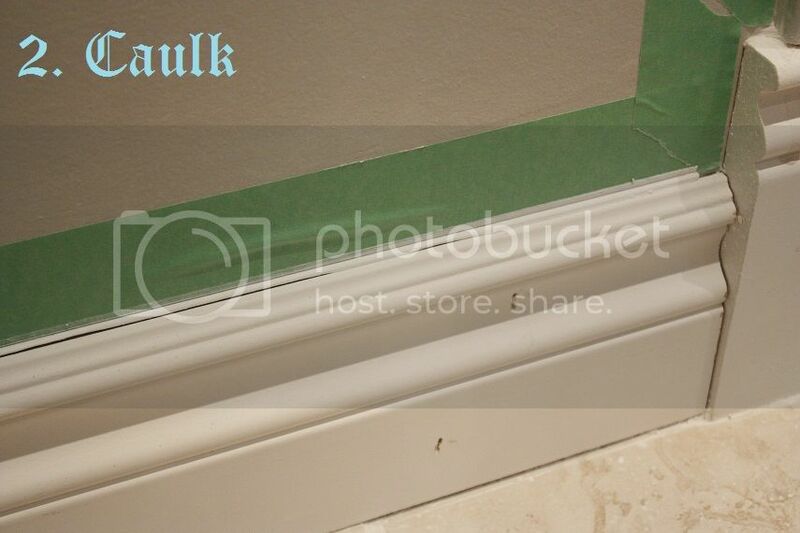 The next step is to run a small line of caulking along the top of the baseboard. 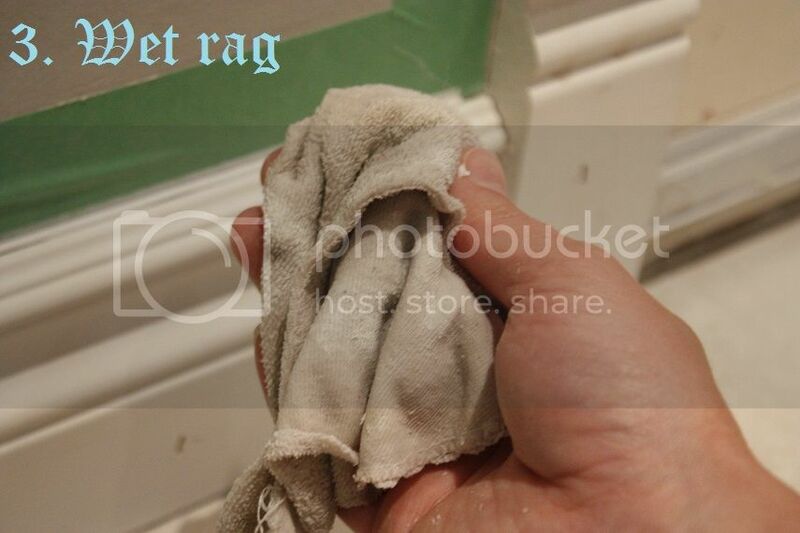 The wet rag is another trick of the trade, when you go to run your finger through the caulking you will get a MUCH smoother finish if you have wet fingers. So I keep an old rag on hand. Yeah, yeah, I can already hear the teenaged boys laughing at this one! There are multiple tools on the market for applying caulking, but I really haven't found anything better (or cheaper) than my finger! This is where my system really starts to save some time. 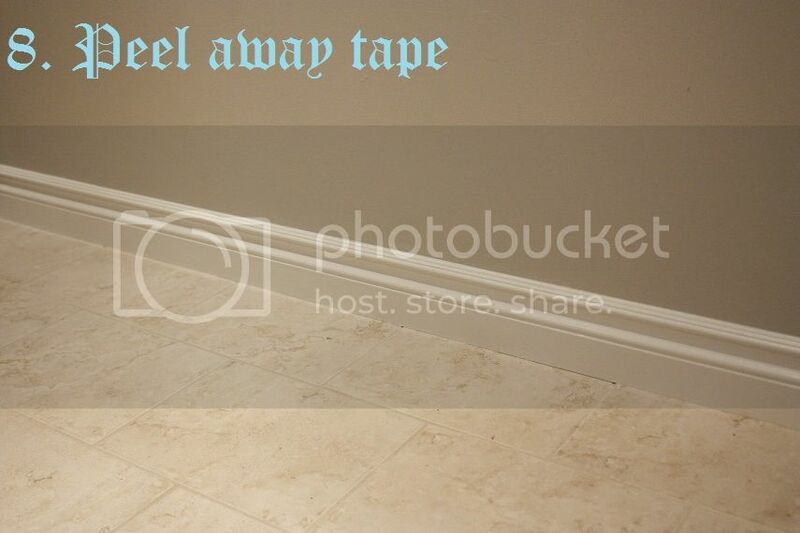 After you have filled all the nail holes and done the top of all the baseboards I tape off the floor. This lets the caulking start to set, but not completely dry before we paint. Because the caulking is not solid yet, I ALWAYS use a high quality brush with nice soft bristles. Harder bristles will ruin that nice finish we have. 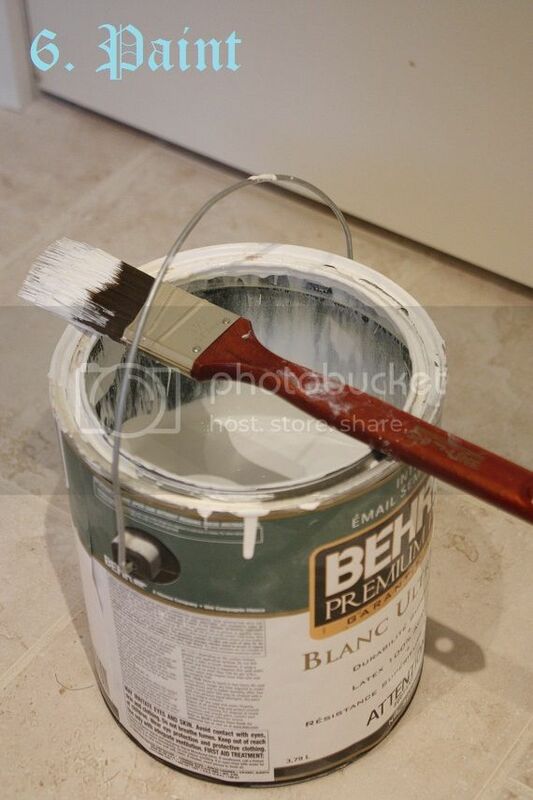 I like to use Mirage White in semi-gloss for all our trim work, but you can use any color. Now I let the paint start to get tacky, but not completely dry. 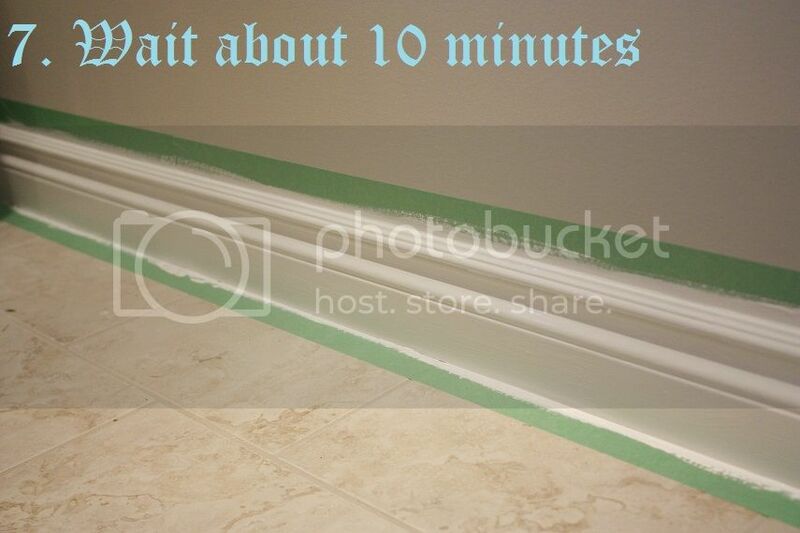 If we waited until the paint and caulking were dry the tape would not come off well and the finish would not look clean (trust me, I've done it!). And last comes my favorite part, the big reveal! 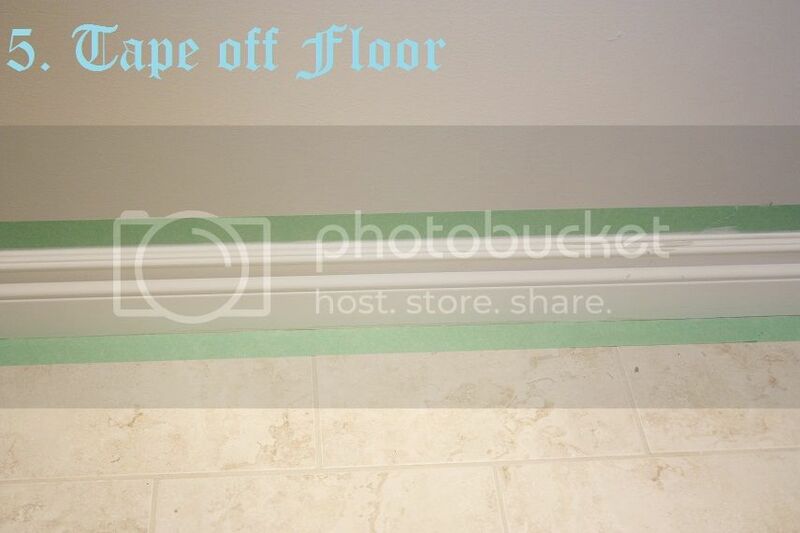 Because we didn't wait to let the caulking dry and then re-tape everything it literally took only 55 minutes from start to finish to do the WHOLE ROOM! Some times with older dry wall you may get some of the wall paint/plaster peeling away with the tape, but I just go back with a touch up brush and the wall color to fix those little patches. With the exception of this door frame (which sees a lot of moisture as it is the door to the garage) all the other tape peeled off perfectly with no peeling! 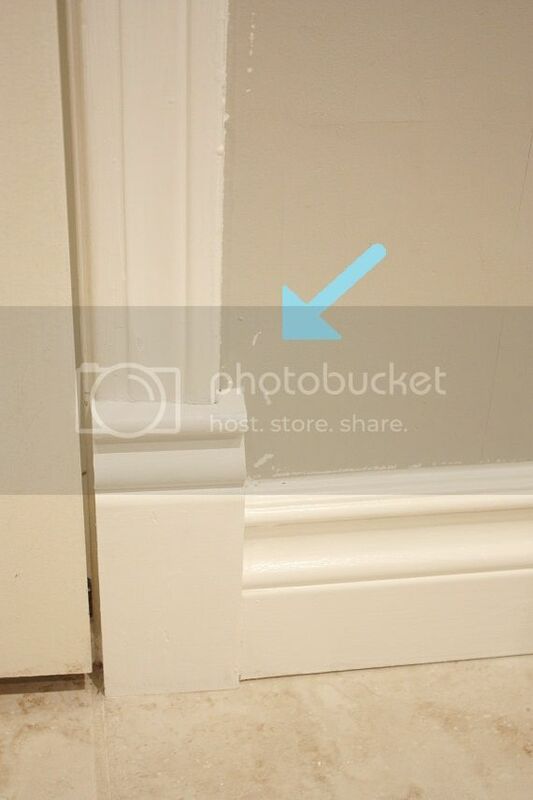 Hope that was helpful to some of you, and will maybe inspire you to update your baseboards or trim!